Fujifilm's first splash into pocketable 3D picture making, the W1, was beset by complicated controls and general first-generation awkwardness. With its successor, the W3, Fujifilm has lessened but not eliminated the headache both of making and viewing your 3D content. 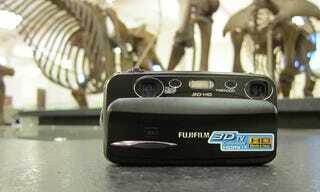 Introducing the camera at the American Museum of Natural History last night, Fujifilm said that the advent of 3DTVs effectively put 3D in "every household." That's far from true. Home 3D, and especially home 3D creation, is still very much a fledgling technology, and if you want people to buy a pocketable camera that shoots 3D, for now, you're going to have to give them a compelling screen to watch 3D on. The W3 (née Fujifilm FinePix Real 3D W3) does just that, stretching its 16:9 parallax barrier LCD to 3.5 inches. It's nice and big and the 3D effect, especially when you're reviewing 3D photographers that you've already taken, is convincing and enjoyable. No glasses required! Video looks OK, too, alternating between satisfying 3D effect and a kind of holographic, spectral three dimensionality, but generally the LCD was too small to keep track what was going on. This on-the-camera 3D experience is solid enough, but Fujifilm also added HDMI 1.4 for checking out your content on a nice big 3DTV. It's here where you'll be reminded that you're no James Cameron. While an aesthetic disparity has and will always exist between photographers who have the eye—a sense of composition, lighting, arrangement, subject, etc—and those who don't, never has the eye mattered as much as it does when you're producing things in 3D. The Fujifilm execs reminded us over and over, like schoolchildren who learn best through repetition, that "depth, depth, depth" is the key to making good 3D. I heard one Fujifilm employee jokingly scold an older gentleman for not allowing the strongly suggested six feet between the camera and the foreground subject of the photo. And so, at least when you're getting started, the 3D stuff you make is a mixed bag. A shot of Central Park I snapped out the window looked OK—all of the buildings in the distance were basically on the same plane and the trees in the front were on another, like the set of a high school play that's supposed to take place in Manhattan. A shot of a crowd of people was less successful, the multiple distinct points of depth in the scene resulting in a sort of muddled quality. But a head-on shot of a mastodon, or some other prehistoric tusked beast, was like Night at the Museum in 3D. The tusks shot out of the camera's LCD smoothly and continuously, and the effect on the Sony 3DTV I plugged into (with the Active Shutter glasses, sadly) was even more impressive. "That's a good one," said a woman standing nearby. My first successful 3D picture! It felt good. But the 3D 720p video was kind of a wash, especially when viewed on the TVs. At least in the museum setting, I couldn't quite find any moving subjects that really made things pop, and my clips were mostly confused and crowded. And it's worth noting that while shooting the videos—and, to a lesser extent, still photos—the LCD screen doesn't quite show you the final product but some pre-3D-magicked mash-up of the images of the two lenses, so you're never quite sure how what you're seeing will compare to what ends up on your memory card. For videos, this was especially jarring, and trying to monitor what you were shooting on the W3's LCD, before it was properly compiled for 3D, was at best annoying and at worst nauseating. Of course, beneath the intriguing 3D surface you'll find a regular, mostly lousy 2D point-and-shoot. The W3 has the same guts as the W1—same 10MP CCD sensor, same RealPhoto processor, same dual 3x optical zoom lenses—though the body of the camera has been slimmed and streamlined appreciably, made more round and less boxy. And it's adopted controls that are considerably easier to deal with than the W1—similar to Fujifilm's non-3D point-and-shoots but still sometimes a bit confusing for some of the W3's unique features, like advanced 2D where you can set different focus or ISO for each lens and snap two distinct photos simultaneously.